Translation of Buddhist texts written in Sanskrit to Chinese. Kumārajīva (Sanskrit: कुमारजीव, simplified Chinese: 鸠摩罗什; traditional Chinese: 鳩摩羅什; pinyin: Jiūmóluóshí; Wade–Giles: Chiu1 mo2 lo2 shih2, 344–413 CE) was a Buddhist monk, scholar, and translator from the Kingdom of Kucha. He first studied teachings of the Sarvastivadin schools, later studied under Buddhasvāmin, and finally became an adherent of Mahayana Buddhism, studying the Mādhyamaka doctrine of Nāgārjuna. Kumārajīva's father Kumārāyana was from the present day Kashmir and his mother was a Kuchan princess who significantly influenced his early studies. His grandfather Ta-to is supposed to have had a great reputation. His father became a monk, left Kashmir, crossed the Pamir Mountains and arrived in Kucha, where he became the royal priest. The sister of the king, Jīva, also known as Jīvaka, married him and they produced Kumārajīva. Jīvaka joined the Tsio-li nunnery, north of Kucha, when Kumārajīva was just seven. When his mother Jīvaka joined the Tsio-li nunnery, Kumārajīva was just seven but is said to have already committed many texts and sutras to memory. He proceeded to learn Abhidharma, and after two years, at the age of nine, he was taken to Kashmir by his mother to be better educated under Bandhudatta. There he studied Dīrgha Āgama, Madhyama Āgama and the Kṣudraka, before returning with his mother three years later. On his return via Tokharestan and Kashgar, an arhat predicted that he had a bright future and would introduce many people to Buddhism. Kumārajīva stayed in Kashgar for a year, ordaining the two princely sons of Tsan-kiun (himself the son of the king of Yarkand) and studying the Abhidharma Piṭaka of the Sarvastivada under the Kashmirian Buddhayaśa, as well as the four Vedas, five sciences, Brahmanical sacred texts, astronomy. He studied mainly Āgama and Sarvastivada doctrines at this time. 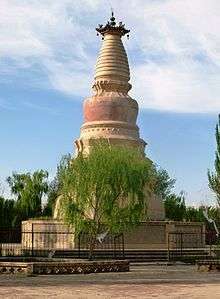 Kumārajīva left Kashgar with his mother Jīvaka at age 12, and traveled to Turpan, the north-eastern limit of the kingdom of Kucha, which was home to more than 10,000 monks. Somewhere around this time, he encountered the master Suryasoma, who instructed him in early Mahayana texts. Kumārajīva soon converted, and began studying Madhyamaka texts such as the works of Nagarjuna. In Turpan his fame spread after beating a Tirthika teacher in debate, and King Po-Shui of Kucha came to Turpan to ask Kumārajīva personally to return with him to Kucha city. Kumārajīva obliged and returned to instruct the king's daughter A-kie-ye-mo-ti, who had become a nun, in the Mahāsannipāta and Avatamsaka Sutras. In 379 CE, Kumārajīva's fame reached China when a Chinese Buddhist monk named Seng Jun visited Kucha and described Kumārajīva's abilities. Efforts were then made by Emperor Fu Jian (苻堅) of the Former Qin Dynasty to bring Kumārajīva to Qin capital of Chang'an. To do this, his general Lü Guang was dispatched with an army in order to conquer Kucha and return with Kumārajīva. Fu Jian is recorded as telling his general, "Send me Kumārajīva as soon as you conquer Kucha." However, when Fu Jian's main army at the capital was defeated, his general Lü Guang declared his own state and became a warlord in 386 CE, and had Kumārajīva captured when he was around 40 years old. Being a non-Buddhist, Lü Guang had Kumārajīva imprisoned for many years, essentially as booty. During this time, it is thought that Kumārajīva became familiar with the Chinese language. Kumarajiva was also coerced by Lü into marrying the Kutcha King's daughter, which resulted in his chastity vow being negated. After the Yao family of Former Qin overthrew the previous ruler Fu Jian, the emperor Yao Xing made repeated pleas to the warlords of the Lü family to free Kumārajīva and send him east to Chang'an. When the Lü family would not free Kumārajīva from their hostage, an exasperated Yao Xing had armies dispatched to Liangzhou in order to defeat the warlords of the Lü family and to have Kumārajīva brought back to them. Finally the armies of Emperor Yao succeeded in defeating the Lü family, and Kumārajīva was brought east to the capital of Chang'an in 401 CE. The second era of translators A. D. 400 was that of Kumaradjiva of Kashmir. There can be no doubt that he made use of SH and S as separate letters for he never confounds them in his choice of Chinese characters. The Chinese words already introduced by his predecessors he did not alter, and in introducing new terms required in the translation of the Mahayana literature, the texts of the 大乘 Dacheng, or "greater vehicle," he uses SH for SH and usually B for V. Thus the city Shravasti was in Pali Savatthi and in Chinese Sha-ba-ti. Probably Kumaradjiva himself speaking in the Cashmere dialect of Sanscrit called it Shabati. Kumarajiva revolutionized Chinese Buddhism, in clarity and overcoming the previous "geyi" (concept-matching) system of translation through use of Daoist and Confucian terms. His translation style was distinctive, possessing a flowing smoothness that reflects his prioritization on conveying the meaning as opposed to precise literal rendering. Because of this, his renderings of seminal Mahayana texts have often remained more popular than later, more literal translations, e.g. those of Xuanzang. Sengrui had some influence on this final polished style, as the final editor of his translation works. [W]here Kumarajiva's work can be compared with an extant Indic manuscript – that is, in those rare cases where part or all of a text he translated has survived in a Sanskrit or Prakrit version – a somewhat surprising result emerges. While his translations are indeed shorter in many instances than their extant (and much later) Sanskrit counterparts, when earlier Indic-language manuscript fragments are available they often provide exact parallels of Kumarajiva's supposed "abbreviations." What seems likely to have happened, in sum, is that Kumarajiva was working from earlier Indian versions in which these expansions had not yet taken place. Kumarajiva had four main disciples: Daosheng, Sengzhao, Daorong (道融), and Sengrui. Nattier, Jan. The Heart Sutra: A Chinese Apocryphal Text?. Journal of the International Association of Buddhist Studies Vol. 15 (2), 153-223 (1992). Wikimedia Commons has media related to Kumarajiva.